Instructors are required by law to accommodate students with disabilities by extending the time limit of exams. You may also need to extend days for readings (modules), discussions, assignments and tests to accommodate students who need extra days to complete or make up work for other legitimate reasons. Etudes allows you to extend the days of modules, assignments, tests, surveys, and discussions and the time limit of tests and quizzes for a specific student across Etudes with a couple of clicks. You may also remove the time limit completely for visually-impaired students. Click on the Special Access icon to the far right of the student’s name. Enter additional days and / or extension in the time limit. Days apply to due and allow until dates that are set in Modules, Discussions, and AT&S. The time limit applies only to tests, quizzes and assignments that are timed. You can extend the time limit of all assessments by specifying extra minutes, as in the above example, or you can extend time in all assessments by specifying a multiplier for all time limits (i.e. 1.5 or 2 times). This is a better option when different tests have different time limits. So, if the existing time limit on a test is 10 minutes and the instructor enters a multiplier of 1.5 to give special access to a student, the new time limit for the student will be 15 minutes. To further accommodate the needs of visually-impaired students, Etudes includes an additional setting under global special access that allows you to remove the time limit from all timed assessments for a specific student. The problem is that blind students can’t focus on listening to and answering the questions that are being read by Screen Reader software, like JAWS, when a timer counts down at the same time, over the questions that are being read. It’s extremely confusing. Please remove the time limit for blind learners. 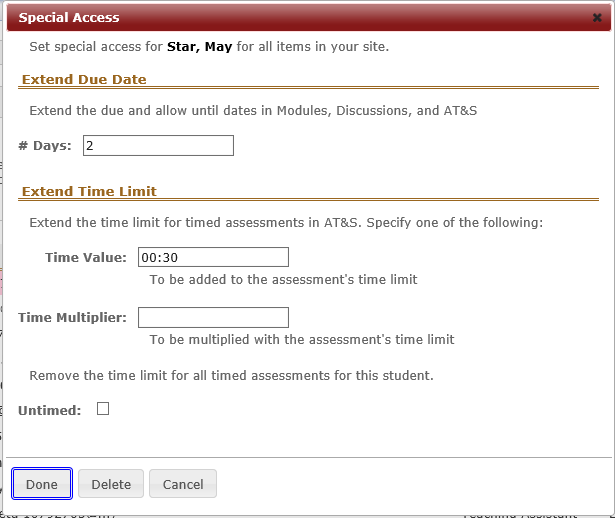 By checking “Untimed,” Etudes will remove the time limit for all assessments for the selected student. If a student has been given special access – either from Roster or from a tool, the icon will inform you of it. When clicked on, the Set Special Access screen shows which tools have special access set for this student. If you had given a student special access in some areas of Etudes using the controls available there, the global specific access will overwrite any prior special access permissions you had assigned. Etudes will alert you. What if you made a mistake and wish to remove special access privileges for a student? You can remove all special access permissions given to a student by clicking on the Delete button under his/her special access in Roster. As always, you will be asked to confirm the deletion.